There are bus services between the airport, major cites,and also to Dublin airport. Taxi to Shannon costs approximately 10 Euros. 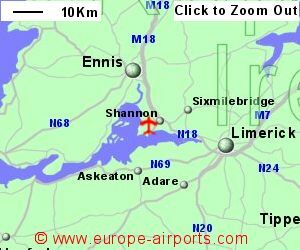 A taxi to Limerick or Ennis, both which have rail stations, is likely to cost 40 Euros. 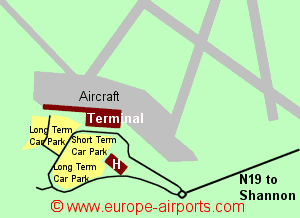 The Short Stay car park is located immediately opposite the terminal building and Long Stay car parks are within 400m. Shannon airport has 4 bars/restaurants, 3 shops, a bank, 3 currency exchange facilities, 2 ATMs, an executive lounge, and FREE WiFi Internet access. An hotel is located on the airport site. Shannon airport has Airport Carbon Accreditation, at the reduction level. Shannon airport handled 1.7 million passengers in 2017, a very slight increase from the previous year, and well below the airports highest passenger total of 3.6 million in 2006. 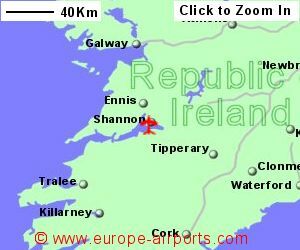 Shannon airport is the third busiest in the Republic of Ireland.